Lucky Everyday by Bapsy Jain. "We are not human beings seeking spiritual experience, but spiritual beings undergoing a human experience." Not long ago, Lucky Boyce had every reason to believe that she had been aptly named. After her big promotion at Paterson & Company in New York, the lovely Lucky was wooed and won by the dashing and highly eligible Vikram Singh. He whisked her off to Bombay and marked her as his bride with a custom-made, four-carat, heart-shaped diamond ring. Lucky felt as if the world were at her feet. Until Vikram forcibly and without warning threatened to annul their marriage which ended in divorce stripping Lucky of everything she cared about: husband, wealth, and her nascent career as a jewelry exporter. Completely unmoored and seeking refuge in New York with her old friends Alec and Susan, Lucky has no inkling that her life was about to take a dramatic new turn. But will she be able to open herself up to it? It is Alec who convinces Lucky to volunteer as a yoga instructor at the state penitentiary. The men’s aggressive posturing intimidates her at first, but Lucky’s no-nonsense attitude and her ability to do one-handed push-ups wins their grudging respect. Even more surprising, Lucky finds students like Rooster and Steve who are willing to put aside their preconceived notions and open themselves up to the truths that yoga offers. Sharing this knowledge with others that truly appreciate it brings Lucky closer to Shanti the yogi back in Bombay who rescued her in the darkest days of her failed marriage and begins to restore her shaken self-confidence. While teaching yoga enriches her soul, her pockets remain empty. With little else beside her flamboyant engagement ring, Lucky decides to collect on a few debts from her days as a businesswoman, running a firm for Vikram’s family. The owner, Mike Lockwood, is a bit of a shady character but he respects Lucky’s abilities and agrees to pay her back if she helps him turn his own ailing business around. She accepts and finds herself enjoying both the camaraderie and the challenge. Yet, Lucky is hardly settled in her new life when she is brutally mugged and winds up with a broken wrist that might be permanently paralyzed. While Mike and her old friends rally around her, Lucky is beset by one calamity after another only to find herself at the center of a web of lies that may spell complete ruin. Lucky wonders what she has done to deserve such ill fortune but reflecting on Shanti’s teachings realizes that it is she alone who has the power to break free. 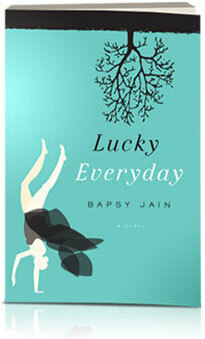 In her charming and utterly original debut novel, Bapsy Jain juxtaposes Lucky’s current adventures with her carefree single days and the decay of her marriage. Part women’s fiction, part thriller, and part spiritual parable, Lucky Everday is a wise and wondrous meditation on one almost-enlightened every woman’s journey through this life.